Parking Facilities at DeVos Place are managed by the City of Grand Rapids. Event parking is $10 in the underground parking at DeVos Place in the area marked A. Event parking applies to those parking AFTER 7AM on Friday, December 2 or at any time on Saturday December 3 and Sunday December 4. (NOTE: those parking in the DeVos Place underground parking area, including volunteers, on Friday morning before 7AM will be subject to the maximum rate of $15.). Street parking throughout most of downtown is free after 6pm on Friday, and free all day on Saturday and Sunday. The only exception is Monroe Center (brick-paved road diagonal from Amway Grand Plaza). On Monroe Center, you must pay the meter on Saturday between 8am and 6pm. Parking on Monroe Center is free after 6pm on Friday, free after 6pm on Saturday, and free all day on Sunday. 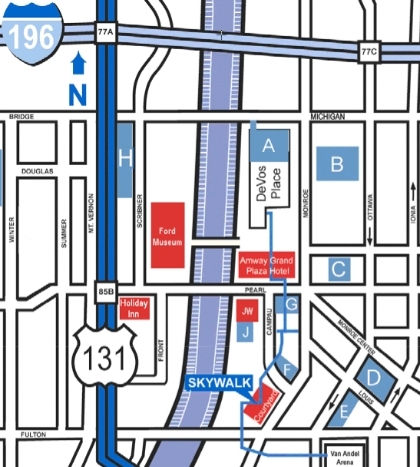 For additional parking options and prices, please check out the interactive downtown parking map courtesy of downtowngr.org. Guests of the JW Marriott, Amway Grand Plaza and Courtyard by Marriott receive free "self-parking" at their hotel parking facility as a benefit of registering under the Gymnastics on the Grand block of rooms. Valet parking is available for an additional fee. If you are self-parking your vehicle, please mention it at the time you make your hotel reservation to ensure that your check-in process runs as smoothly as possible. You will need to bring your parking ticket to the front desk of your hotel to be stamped prior to check-out. Please see the Where to Stay page for more details on hotels, rates and hotel parking.